The afternoon sun beat down on the Land Cruiser as we left to make the long arduous trip from Monrovia to Yekepa. It was almost too late to start the 7-8 hour drive but at least it was the dry season – no rain, no mud. The red dust of Liberia swirled around our car. Dust so fine that it coats your nose and throat and hair, even if the windows of the vehicle are rolled up. The first leg of our trip was only a few miles down the road. 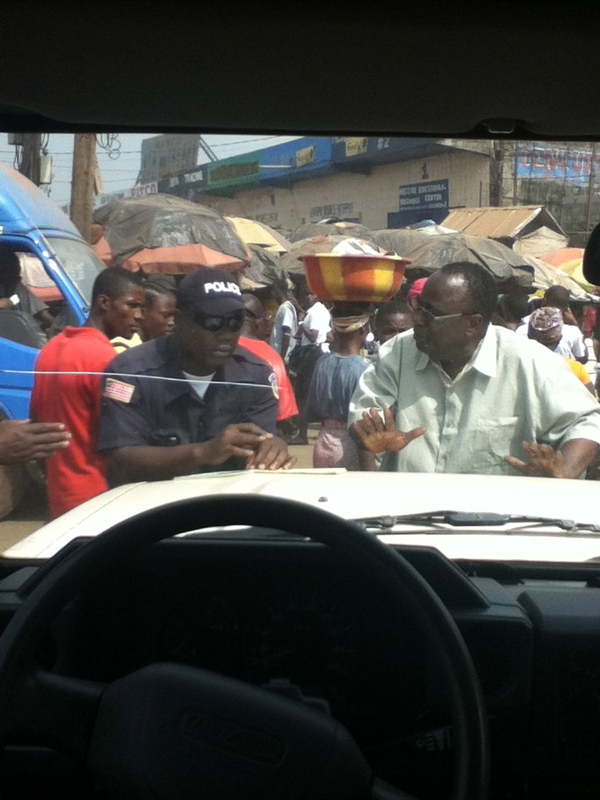 We followed the university’s president to Red Light to pick-up frozen chicken and fish to take to Yekepa. Red Light is a hustling, congested, 24/7 commercial market, with all types of activities including crime and prostitution. We turned onto the boulevard, which out of shear necessity often becomes a five-lane road to accommodate the merging traffic. 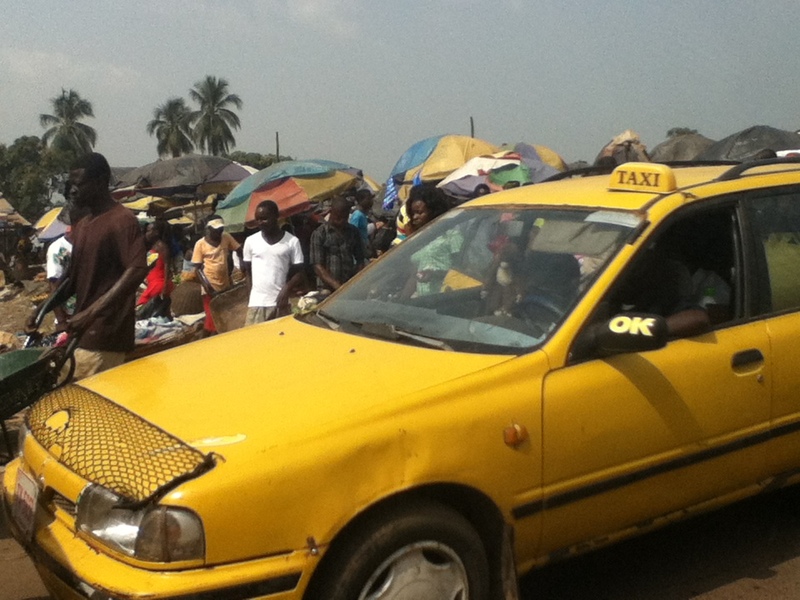 Resurrected cars pulled along side of beat up taxis, jockeying for position on the road. Horns honked, fists waved, motorcycles veered in and out of the traffic; pedestrians pushing wheelbarrows filled with goods bravely darted among the cars to get to the other side. Entering the market one’s senses became overwhelmed with the crush of people, the cacophony of noise, and the smell of food and garbage. The vivid color of African clothing was juxtaposed against the second-hand Western clothes that were being worn and sold. Taxi cab maneuvers through the traffic. Vendors displayed their wares under once colorful umbrellas faded by the sun. Other sellers spread blankets down on the dirt, stood on corners, or moved through out the crowd hawking their wares. Garbage piles were knee deep in front of some vendors emitting a foul odor as the piles baked in the hot sun. Other garbage was being burned; the acrid smell of smoke curled up into the air. We arrived to pick up the food, but there was no place to park so our driver maneuvered the car between the crowd and the side of the busy road. He asked a policeman if he could park there. The president and his driver had already stepped out of their car to go into the store; our driver soon followed. There we were three “mzunga” (east Africa word for white people) sitting in the hot afternoon sun with our windows only slightly rolled down because of concerns for safety. Sweat rolled down my forehead and the back of my neck. People surrounded our vehicle on both sides as they moved here and there – starring at us as if we were in a fish bowl. Others sidled up to the car trying to sell us something or to ask for money. A man stood, with his back to my window, attempting to entice people to buy a small square flashlight. Over and over he shouted, “One thirty-five, one thirty-five, flash light for one thirty-five.” Only one person stopped to look at the light, but I don’t think the person bought one. Whether a light was sold or not probably determined if the man would have anything to eat that night. 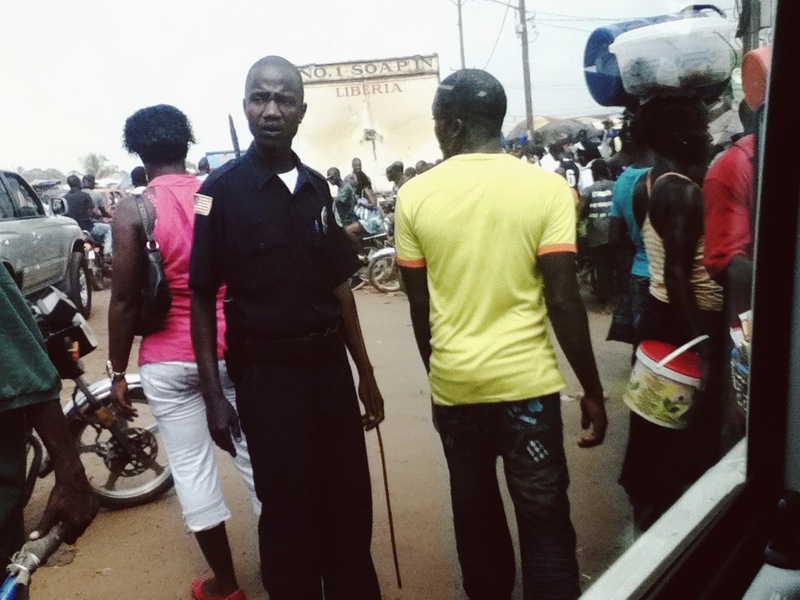 In front of us, we watched as a policeman took bribes. This is the way of life. The driver was gone, we had no key – no way to move the car, and where would we have gone if we could? A policeman appeared and then two more. About this time our driver came back and explained to the policemen that we were told that we could park there, but no one chose to believe the driver. A crowd started to surround us to see what was going on – entertainment for the day. Another policeman was called to come over, and the one who gave us permission to park maneuvered through the crowd and approached us. Of course, he did not verify our story. People crowd around our vehicle to see what is happening. In the midst of the chaos, the people from the store began to load 500 lbs of rice in the back of the Land Cruiser and approximately 500 lbs of frozen fish and chicken on top. Thrrump, thrrump, thrrump – the vehicle vibrated and the roof pressed downward each time the frozen goods were tossed up on the roof. 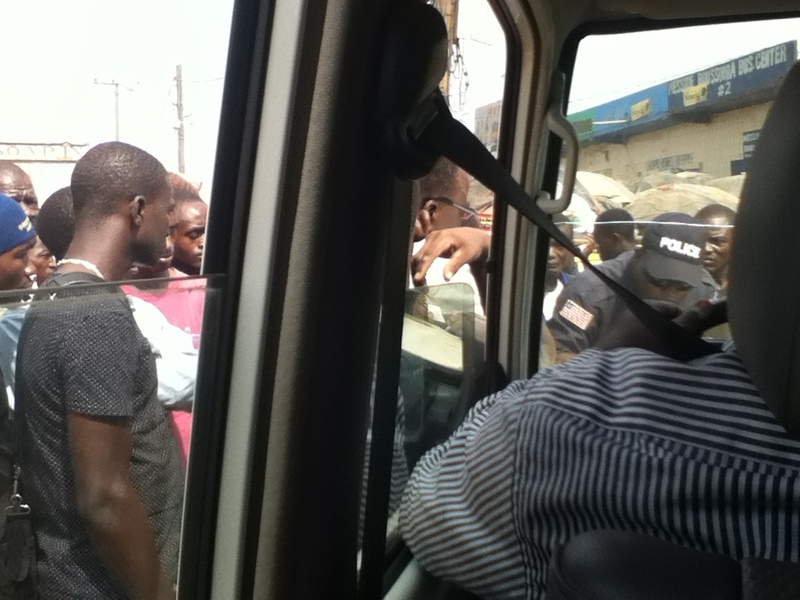 The police continued to argue with our driver about the violation. More people gathered around us. Our president came and intervened. By now, my clothes are soaked with perspiration. I thought to myself, instead of going to Yekepa we may be going to jail. No bribe is offered. A $50.00 ticket is issued and a policeman waved us away. We slowly pulled out on to the crowded boulevard loaded down with rice, chicken, and fish. Eight hours later, we make it to Yekepa. Pretty scary experience! It reminds me of the time I was taking pictures out the window of the car in Monrovia. A police stopped us and questioned why we were taking pictures. We were at a stop light waiting to turn left. The police wanted us to stop and pull over. Instead, our driver turned left and kept going. They are very suspicious of us white people. Certainly my plan to make it back without any problems. I remember hearing about that incident in Monrovia. I think Jameso was driving:-). I didn’t feel scared as so much thinking about sitting in a hot, and I am sure dirty, police station after being in the car for so long. Thanks for the slice of life from the Red Light market and for posting the incognito photos from the iPod spymaster. You must have been melting in the sweltering heat of the Land Cruiser and have felt utterly gross with the dust caked on top of dripping sweat. Hope you had a good bubble bath in Yekepa! 🙂 … and that the fish and chicken were worth it! Our temperatures are on the opposite end of the thermometer from yours! Instead of 33 C (89 F), it’s -12C (10F) here right now and snowing a foot a day it seems. I’ve posted pictures on FB: they might help cool you down! Beautiful photographs Dian – I looked at them on Facebook. I could have used some of that snow. Actually, the last few days have been pretty pleasant here b/c the Harmattan is in full swing (dust from Sahara in the air). It looks like a mild to medium fog and the sun is not so hot and the nights are cool. Besides Yekepa is much cooler than Monrovia, which I am most thankful. I am so glad you are safe! You are being given opportunities everyday to put your faith in God’s provision for you to the test. I can’t say I really was scared as much as wondering what was going to happen next and dreading the thought of being detained longer. I can tell you that I was really hot! However, you never know what might happen.